Cambodia has problems with cheap and sometimes illegal pork from Vietnam flooding its markets, but solutions are starting to emerge. Researchers from U.S. universities and the International Livestock Research Institute (ILRI) are joining with Cambodian colleagues to discover long-term solutions to meet the high demand for meat, dairy and eggs — safely. The gathering was convened by the Feed the Future Innovation Lab for Livestock Systems (LISL) to introduce its newly funded research for development projects to key stakeholders. For the first time in Cambodia, researchers are investigating food safety risks in animal-source food production as well as their local economic and health impacts. This ILRI-led research project, “Safe Food, Fair Food,” received funding in August 2017 from the LISL. This September at the meeting in Cambodia, Dr. Hung Nguyen-Viet inspired participants with findings from a similar initiative, which influenced national policy in Vietnam. The new Cambodian project has eight research collaborators, representing three continents, including two from ILRI: Nguyen-Viet, and the project’s leader, Dr. Delia Grace, based in Kenya. Dr. Melissa Young hails from the project’s collaborating institution of Emory University in Atlanta. The meeting, organized by the LISL, gathered 39 major livestock and nutrition stakeholders. It represented the second phase of an approach to foster linkages between the research projects funded by the Innovation Lab and diverse stakeholders in each country, throughout the duration of the funded projects. Called an Innovation Platform, the approach creates circles of feedback around research projects stemming from co-created priorities within a given county. The Livestock Systems Innovation Lab hosts annual Innovation Platform meetings in all its targeted countries. Instead of leaving researchers to work in isolation, the Innovation Platform provides structured feedback and linkages to the stakeholders in the field, such as government officials, private sector, producer organizations, development projects and other researchers. At an Innovation Platform meeting in Rwanda, some researchers found out about the existence of a highly relevant database. Other researchers have discovered and are implementing added value recommendations from their projects, or modifying their research approach as a response to stakeholder suggestions during the Innovation Platform meetings. These unique communities of engagement connect many relevant actors at a national level. In their initial year of 2016, the Innovation Platform meetings reached 340 stakeholders, representing 184 organizations. They established priorities in each of the six target countries of LISL in West Africa (Burkina Faso and Niger), East Africa (Ethiopia and Rwanda) and Southeast Asia (Cambodia and Nepal). In 2017, the second Innovation Platform meetings, which focused on introducing the recently-funded projects to the country stakeholders, have been held in Ethiopia, Rwanda, Nepal and Cambodia. Those for Burkina Faso and Niger are scheduled for October or November 2017. The high demand for pork, which Cambodian producers cannot meet, has spurred imports of pigs across the border. Other problems facing small-scale farmers in Cambodia include disease control and the improper feeding of livestock. A second LISL project, with Kansas State University leadership, discussed at the Innovation Platform, will work on these issues, with the ultimate goal of making Cambodian pig producers more competitive in the region. A third project, led by the University of Tennessee Institute for Agriculture, “Living Fences for Improved Livestock Feed in Cambodian Smallholder Systems” is investigating three shrub species that serve double-duty as livestock feeds and crop fences. 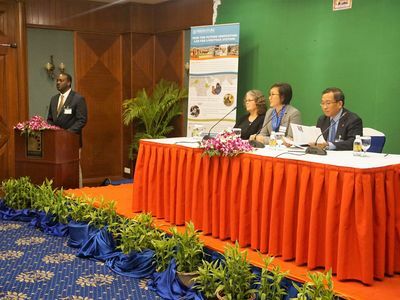 Opening the Innovation Platform meeting was the Director General from the Cambodian General Directorate of Animal Health and Production at the Ministry of Agriculture, Forestry and Fisheries (MAFF), Dr. Sen Sovann, as well as Drs. Sang Lee and Elaine Grings from the USAID Mission in Cambodia and the USAID Bureau for Food Security in Washington DC, respectively. The meeting organizer, the Feed the Future Innovation Lab for Livestock Systems, is the youngest of the 24 Innovation Labs at U.S. universities. Based at the Institute of Food and Agricultural Sciences, University of Florida, it seeks to improve the nutrition, health and wealth of some of the world’s poorest people who raise cattle, goats, pigs and other livestock. Cambodia HARVEST (Helping Address Rural Vulnerability and Ecosystem STability) has reached 35,000 rural Cambodians since the program began in December 2010. Check out this photo storyboard to learn about some recent program highlights and visit cambodiaharvest.org for more information.